Attending a concert or event at Phoenix's Symphony Hall? Convenient parking is available at the following locations. Click on the map shown below for more information on nearby parking. 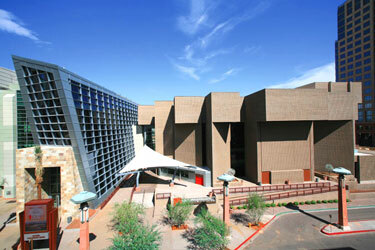 Symphony Hall is a multi-purpose auditorium located in downtown Phoenix, and is home of the Phoenix Symphony, Arizona Opera, and Ballet Arizona. The venue also hosts Broadway touring companies, a variety of dance productions, special appearances by popular entertainers, business seminars, and conventions.